Weekend begins!! yaay! I read somewhere that this year there will be a lot of long weekends as in lot of holidays will be falling on either on Friday or Monday or can be on both making the weekend reallly long! So, you can plan a short trip may be. 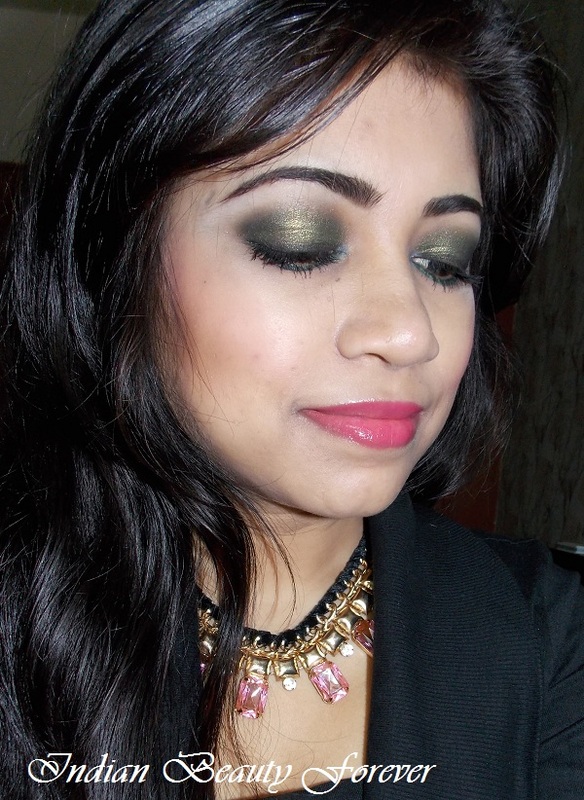 I will be sharing this eye makeup look where I have used Emerald that was also 2013's Pontone Color. The color that I have used, is a mix between olive and emerald actually. I have already done a similar looking eye makeup here but just added a couple of twist to it and paired it with the glossy pink lips and soft pink blush. 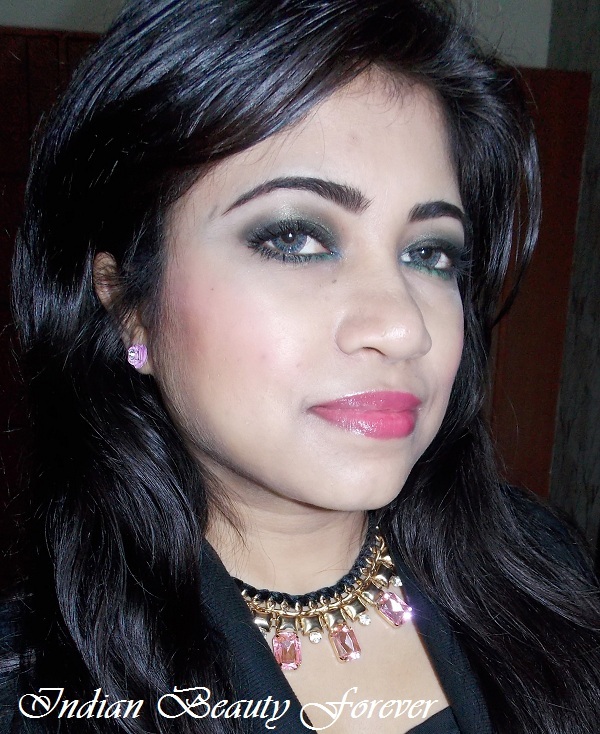 This can be a look that you may sport during the night time as it has got smokiness when to comes to eye makeup. 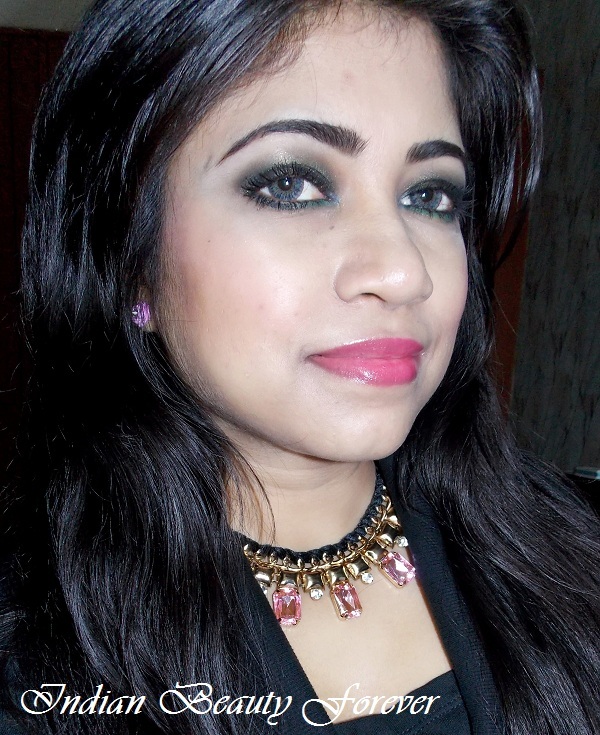 If you want to go for the classic smokey eyes and red lips then this can also be paired with red lipsticks. If, you are on the dusky side, choose a peachy or burgundy blusher though lightly. Here are the steps for the eye makeup. I primed my eyes already with Faces Canada eye primer and filled in my brows. To see the brow tutorial See here. I have done an elaborate step by step tutorial as to how I fill my brows. Here I forgot to use a spooly to comb the brows and they look a bit unruly in the photos. I was feeling like using a wand over the pictures when I transferred them to my laptop! Step 1- I used a black eyes shadow on my entire lid, just a bit above my crease and also applied a white eyeliner pencil on the inner corner of my eyes. 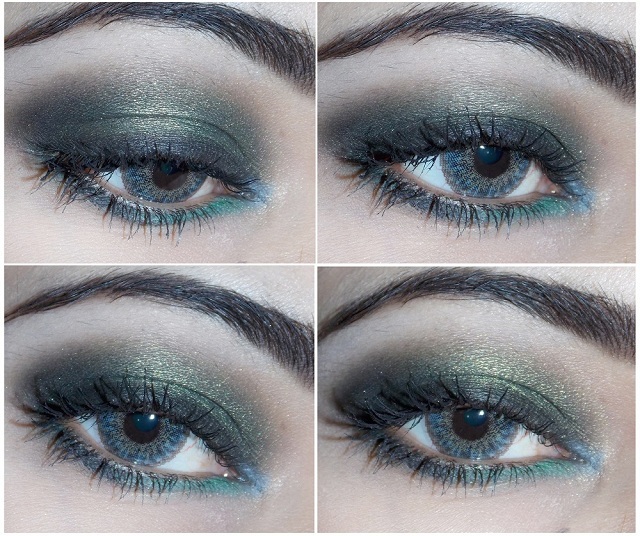 Step 2- Below the crease and on the lid, I used this shimmery emerald olive green eye shadow from my 120 eye shadow palette and just blended it a little above the crease. While using shimmery shadows, they are more likely to get scattered underneath the eyes, therefore, it's always better to use some loose powder under the eyes so when you see any fall outs you can take a big brush and dust them off. Step 3- I used a black eye shadow close to my upper lashline like an eyeliner but didn't wanted it to be too obvious but just to darken the area than the rest of the lid. 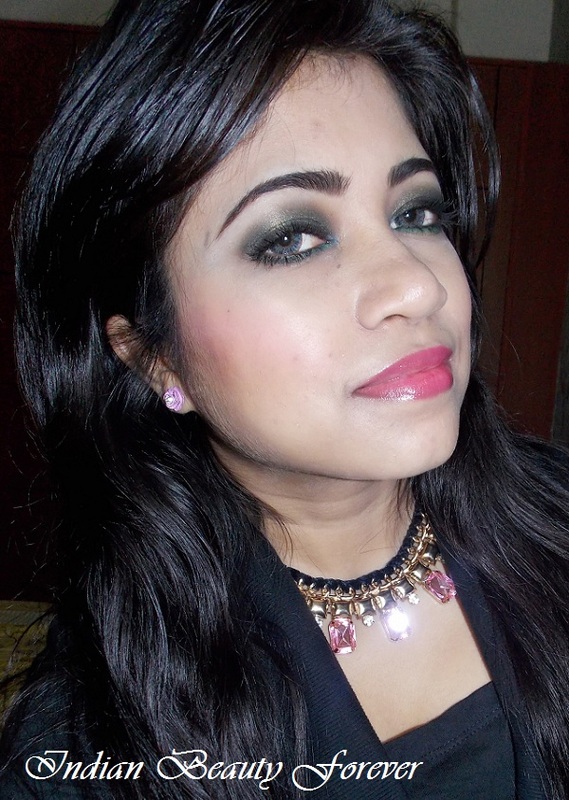 I also used a matte green eye shadow on the lower lash line. Step 4- After that I also added some black over it. 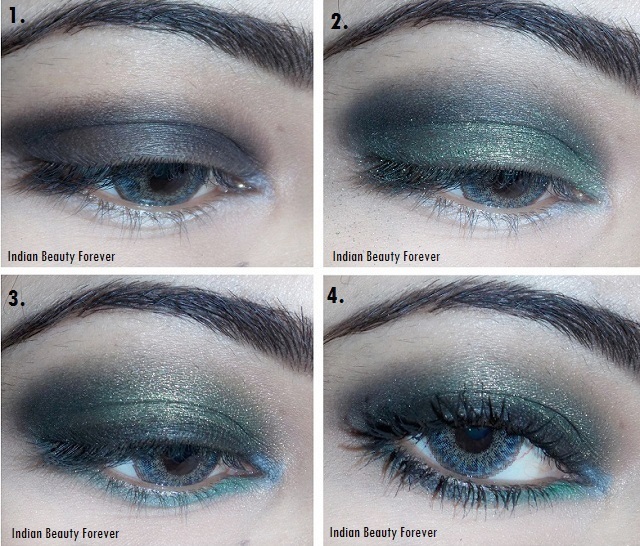 This small step can transform most of the colorful looks into smokey instantly. Try it, it really works especially when you don't want to use kohl on the waterline. I rarely use kohl so, I take help of this step which actually does give great effect when it comes to smokiness and making the eyes even larger. I finished off with a couple of coats with mascara. For the face, I primed my face and then started with medium coverage foundation concentrating on areas that require a little coverage like the redness under my nose and some shadow under my eyes. I haven't used concealers here, since I don't feel the need to use them here. After that I contoured my cheekbones with an angled brush and some blush. For the lips, I applied Nyx colored balm and some MUA gloss over it.